Late last year, a team of advocates descended on City Hall to urge the City’s Planning Commission to reject the most recent draft of the city’s bike plan for a variety of issues, ranging from equity to the vague nature of the goals and timeline for implementation. The Los Angeles County Bicycle Coalition is hoping for a re-run as the L.A. County Bike Plan heads to the County Planning Commission with many of the same issues needing resolution that the city’s plan had last year at this time. 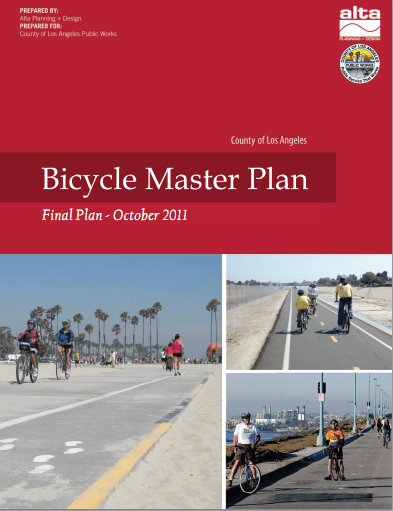 To read the plan, ##http://dpw.lacounty.gov/pdd/bikepath/bikeplan/docs/final%20plan.pdf##click here. This Wednesday morning (full event details at the end of the post), the County Planning Commission will meet at 9:00 A.M. to discuss the draft Bike Plan and the Los Angeles County Bicycle Coalition is urging cyclists to urge the Commission to send the plan back to the staff for further revisions. To help advocates better lobby the County Planning Commission, the LACBC created an action alert on Google Documents for individuals or organizations. The Bike Plan has been in the works since 2009, but this run to the L.A. County Planning Commission feels a bit rushed with recent developments not being taken into account. Most notably, we’re just weeks removed from the triumphant launch of a “Model Design Manual for Living Streets” written by a team of experts including bike planner Ryan Snyder. The manual showed how any municipality could embrace a living streets philospohy to encourage greater physical activity and a more equitable mix of transportation modes. Funding for the Manual came from the L.A. County Public Health Department, yet neither the manual nor its street designs are part of the L.A. County Bike Plan. It’s time for the County’s left and right hands to get an idea of what the other is doing. My main concern with this plan doesn’t have to do with what routes do or don’t appear, there are many cyclists more familiar with Los Angeles’ streets than I am and I would pay close attention to their comments on this matter. Instead, I am worried that this isn’t really what can be considered a “plan” at all. A plan has deadlines, designates who is responsible for what, has a list of goals, objectives, strategies and tactics, and most importantly identifies a source or sources of funding to make the goals, objectives, strategies and tactics of the plan a reality. Bike Plans are needed by municipal and county governments before they can apply for bicycle project grants from the state and federal governments. The L.A. County Plan does the minimum that it has to to meet that objective, but L.A. County hasn’t passed a Bike Plan in 30 years, and the 11 million residents of the county deserve a plan that does more than outline a series of projects. It should create a vision for a bicycle friendly county, and then the projects are designed to meet that goal. For now, L.A. County is missing that mark, and for that reason the LACBC wants staff to take another crack at improving the plan before it moves on to final approval at the L.A. County Board of Supervisors.